Who doesn't want to be a mermaid? 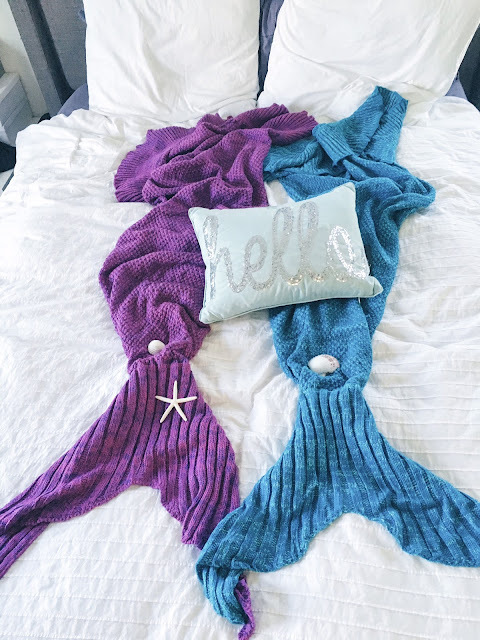 When I saw these mermaid tail blankets, I knew I needed to have them! 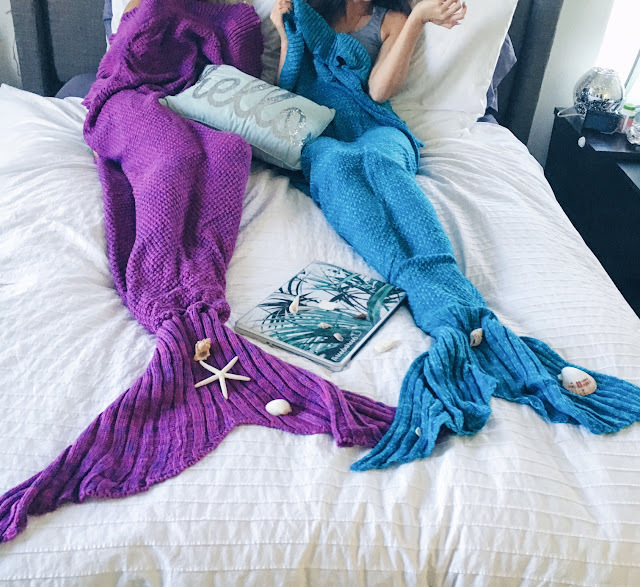 What beats lounging around watching Netflix with your fellow mermaids? Doing the exact same thing while enjoying some Mermaid Strawberry Ice Cream Sandwiches! Keep reading for an easy recipe! 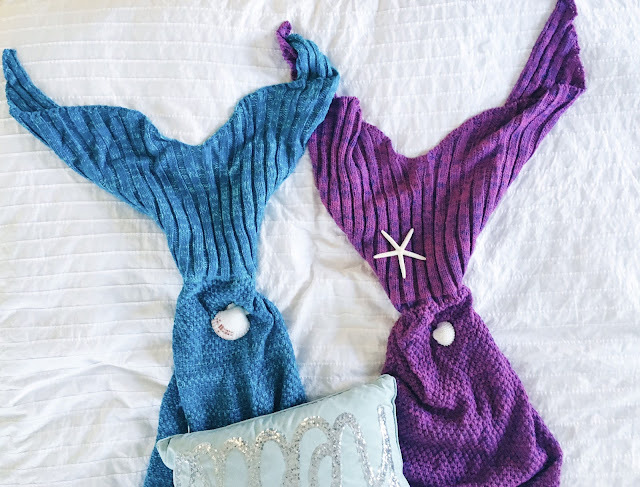 These amazing Mermaid Tail Blankets are from SammyDress. They're super cute and actually really soft and cozy. I love the bright colors that this tale comes in and I love that the blanket and be pulled up over your shoulders so you can really stay warm as the nights start to cool down. SammyDress is an online fast fashion store, and they have lots of trendy clothing and accessories at affordable prices. I'm pleasently surprised about the quality of these blankets, definitely worth the price of less than $20 each! They also have a priority dispatch option which means you won't have to wait weeks for the item to get there! 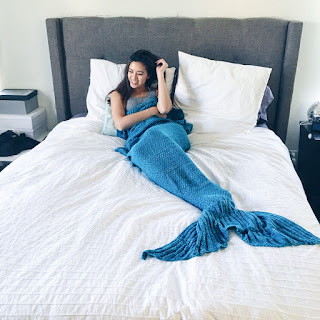 They've got a ton of other options for mermaid blankets also, check it out! *This post was in collaboration with SammyDress and this product was provided for review purposes. The opinions stated above are of course my own. 1. Prep Your cookie sheet or cake pan by lining it with parchment paper so it won't stick. 2. Scoop your ice cream into the lined pan and spread it out from edge to edge. You want it about an inch thick. 3. Chop up your fresh strawberries or defrost your frozen strawberries and mix them into the ice cream and smooth out the edges so that there is a flat 1 inch layer of ice cream. Cover it with another layer of parchment paper and place into the freezer for 1 hour to harden. In the mean time, cut your pound cake into planks of 1/2 inch thick. Use your cookie cutter shape of choice (mine was a seashell of course) to cut out the cake into the shape. these are the "bread" part of your sandwich. Once the ice cream has hardened in the freezer (for 1 hour), use the same cookie cutter to cut out the ice cream shape. You can now start to build the sandwhiches by placing the ice cream cut out on to the cake pieces. And there you have it! 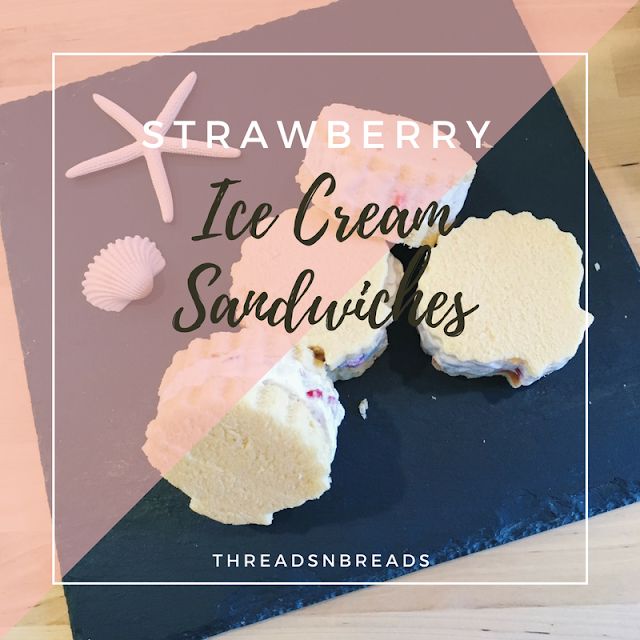 A completed Mermaid Strawberry Ice Cream Sandwich! Enjoy! Those are seriously so cute!!! I need one for sure. And those ice cream sandwiches looked delish!! Those look so good! I love the mermaid blanket too! Those sandwiches look DELICIOUS! And the blankets are adorable! Those blankets are so ridiculously cute and I love those seashell sandwiches!! Oh my goodness, my nieces would love these blankets! So cute! I saw those blankets on Insta and I'm obsessed!! 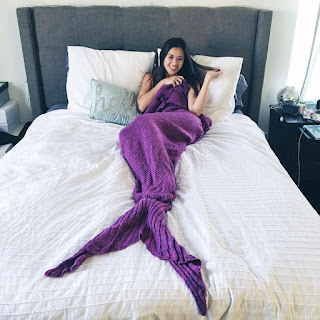 omg these mermaid blankets are so cute and unique! I LOVE these mermaid blankets! They are the BEST! I got one for my sister for christmas -- she's going to squeal!